In this post, we’ll share six business music scheduling hacks that will help you get the most from your business music service. Your music service enables scheduling of playlists. Your broad objective is to maximize the value of your business. You understand your customer demographics and how they might change throughout the day and week. Age is most important. 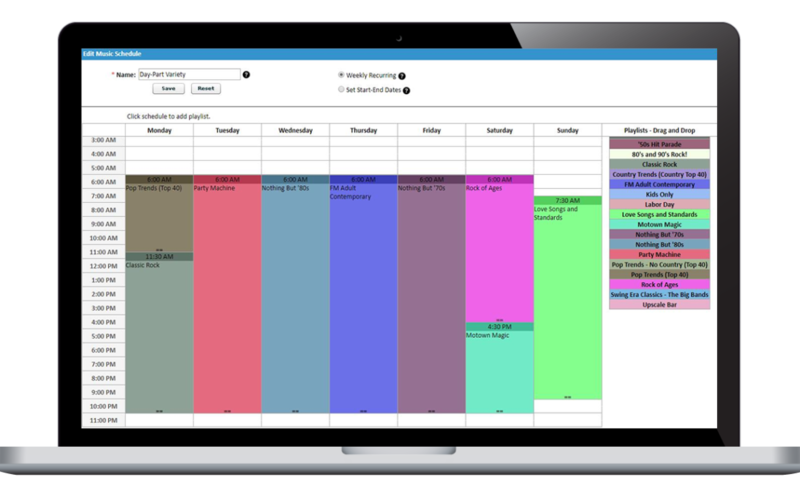 Take a weekly calendar view and plot your store hours. Block off any time periods where demographics naturally shift. For example, does your restaurant serve more Baby Boomers at lunch and more GenXers after hours? Is there a happy hour when the pace and volume need to go up? Does your retail store serve more mom’s during the day, and families after 3:30? Do the weekends bring in a different demographic? Decide on a vibe you want your business to sound like to each demographic. This may, in fact, outweigh any demographic shifts simply because you have a sound you want for your business – no matter the demographic. Just remember to balance that with what music makes each demographic comfortable, and make sure your selection of music genres make sense for your business. You don’t want traditional Italian music in your Asian bistro. It has to make sense. Use your music system’s scheduler to add day-parts based on the blocks you created, your desired vibe. and your audience. Do not schedule music when no one is going to hear it. Music playlists all have a limited number of songs, and you don’t want to “waste” them. This will ensure employees who are there all day hear the fewest amount of repeats possible. If you have employees there after-hours for cleanup, setup, stocking, etc. Schedule something specifically for them. You’ll make them happier and you’ll “save” songs for your business hours. Listen, get feedback and adjust. Listen to the songs yourself, get feedback from employees and customers, and use that information to tweak your music selections and scheduling until you have your business sounding exactly how you want! Like anything worthwhile, getting this right takes some time and effort. But the end result of getting your business music scheduling correct will be an environment that sounds great and makes good sense for your business.